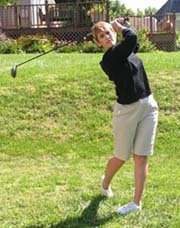 Thanks for stopping by at Golf-Basics-For-Women.com. There may well be thousands of other golf related sites, but here’s why we’re different. Most other sites focus on the playing of the game or a specific aspect of it. 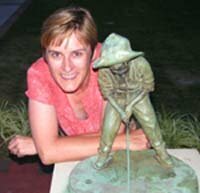 Our aim is to gently guide you through those daunting first steps you make as a woman with a desire to either learn how to play or improve your golf game. We wish to provide a complete source of information including, but not limited to, etiquette, rules, equipment, clothing, improvement practice drills and all other things golf. I wasn’t born into or reared in a golfing environment: my parents didn’t and still don’t play. In fact, I didn’t start playing till the ripe old age of thirty-two. Apparently I had a very good looking, natural swing for a beginner. I looked the part which, although nice and comforting, paradoxically was intimidating to the guys responsible for allocating my first handicap of 30. Handicap assessment should be calculated on scoring ability only, not the potential of a nice, fluid swing. However, not everyone welcomes a new woman player into the game of competitive golf. In spite of the less than welcoming attitude of some of my fellow (male) competitors, I was well and truly hooked on the game and decided to stick with it. With the help and encouragement of a good friend, and later some instruction by PGA professionals, I gradually improved my game and lowered my handicap, the only true measure of improvement in the game. I am really very pleased that I took up the game of golf and have been privileged and very fortunate to have played a vast range of courses from Municipal to Championship level, all of them beautiful in some way or another and a great test of my golfing ability. Once you have mastered the basics of the game and suffered the frustrations of a key part of your game desert you, causing you to spend even more practice time on it while neglecting other parts which were all right the last time, you start thinking seriously about the technical side of the game. At this stage I would have to admit to maybe going a little over the top. 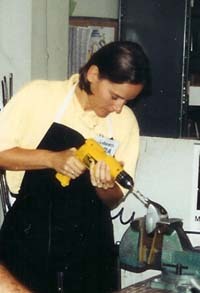 I took the Golf Club-making & Repair course offered by Golfsmith in Austin, TX. I loved it, and really enjoyed fitting people, building sets of clubs for them and seeing the improvement to their games as a direct result. I was so hooked by now that I took the Advanced Club-fitting course a year later. It’s not all technical jargon you learn on these courses, it's more about an appreciation of how it all fits together. It shows why certain types of swing should have one type of equipment whereas another swing requires something entirely different. To put it all into perspective for you: if you wanted to look your very best for some special occasion, you would probably have an outfit made to measure. Then why on earth would you expect to play your best golf with clubs you bought “off the rack” ? I then further enhanced my knowledge about the game and the people who play it working as a caddie at Whistling Straits, venue for the 2004 PGA Championships. Whistling Straits is also a very popular site for corporate outings. One thing that my time on the bag there taught me is that slow play is the biggest etiquette issue on crowded courses. I also found out that some guys just don’t like female caddies and will not accept their advice even if it is the first time they set foot on the course that the caddie goes around twice a day on different bags with players of differing abilities. Heck, playing the course yourself as often as possible was one of the perks. Oh well, there’s just no telling for some folk. Fortunately, they were a minority. Most of the guys thought it was great! From starting to play golf on a little par 3 desert course to reducing my handicap to a more than acceptable level, coaching beginners and juniors, caddying at a Championship course, fitting and building clubs (and not just for new people to the game; one of my customers had played golf for 50 years) all took me just 7 years. My first “Coach” told me when I first started playing that it takes about 7 years before you can take the “L” plates off your back. Well, I sure learned a heck-of-a-lot in those years. I recently played against him and managed to beat him. Basically I played to my handicap better than he played to his… An example of the beauty and fairness of the handicapping system that allows golfers of different skill levels to compete. So come on now girls, you wouldn’t have kept on reading this far if you weren’t interested, so get started golfing now!